At the start of DS9, nearly all of the major characters have lost something dear to them, and in turn, they feel lost. First we have Benjamin Sisko and his son Jake. They have just lost their wife/mother after the tragedy of Wolf 3-5-9 and are struck with not only her loss but the feeling of powerlessness that accompanies it. Jennifer was both Benjamin and Jake’s rock, and her loss colors everything they do and see. (s4e17), she wanted to be an artist before the Occupation. She lost companions, her ability to create art, and much more during the Occupation of Bajor, and now that the war is over she has lost her sense of purpose. 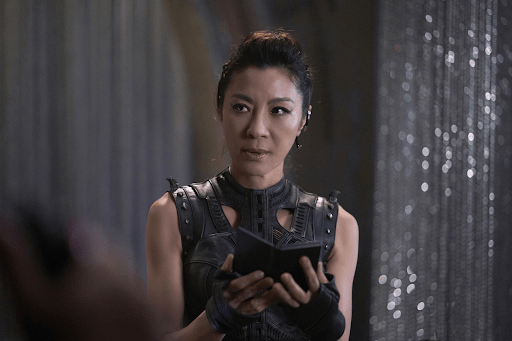 Kira must learn to work with the Federation and trust again, and find herself in a world that doesn’t need terrorists (at least for the time being). Odo and Quark are both at a loss when DS9 begins because they were both benefiting from the Cardassian Occupation. Odo worked for the Cardassians as a security officer, and is well aware of the atrocities he had a hand in. We learn in “Necessary Evil” (s2e8) that he feels so much regret for his actions that he has tried to essentially block them out, creating a new persona. And he is deeply concerned that he will lose not only his place on the Station but also his place in the universe, because he thinks he is the only one of his kind. Similarly, Quark’s bar (“Come to Quark’s, Quark’s is great!”) did quite well during the Occupation, and now that the Federation is in charge he isn’t sure if he will even be allowed to continue operating a bar on the station at all, or how the Federation will require him to function if they do allow him to stay. Sisko essentially has to blackmail him to stay by using Quark’s nephew Nog’s thieving ways as leverage (“Emissary”). Quark, ever the capitalist, accepts these terms, but it is clear that he isn’t sure how it will play out or if it will even be remotely profitable for him. When Jadzia Dax is killed by the ex-Cardassian leader Gul Dukat, the Dax symbiont is joined with Ezri, and Ezri doesn’t feel worthy. She is lost and alone. Nearly everyone (save the Sisko family) sees her as an imposter, and she lacks the confidence needed to be able to handle that external pressure on top of her internal turmoil about her worthiness. Even Garak doesn’t trust her. She doubts her abilities as a counselor, and as Garak so pointedly says when she tries to help him, “How can you help me. You can’t even help yourself?” (“Afterimage” s7e3). It isn’t until several episodes into Season 7 that she begins to feel less lost and powerless, and fully embraces her role as a Dax. 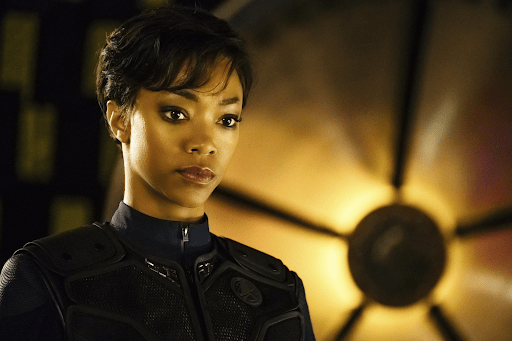 In Discovery’s pilot “The Vulcan Hello,” Michael Burnham is isolated in her loss. She has lost both her parents and arguably her sense of self/humanity – but also is lost, because she doesn’t really know what it means to be human. She is a young human girl whose parents were murdered by Klingons, being raised on Vulcan. She believes that she was rejected from the Vulcan Science Academy due to her own failings and her humanity, though we later find out it was because Sarek chose Spock over her. If she was lost before, she quickly spirals into madness because all of her fears and past traumas come to light upon literally seeing Klingons. Klingons killed her parents. They tried to kill her too, as a girl. Once she starts the Klingon War they kill her Captain, who in many ways, is a surrogate mother. She is so in conflict with herself that she actually mutinies against her captain and everything she loves out of fear of losing them, which creates a self- fulfilling prophecy. 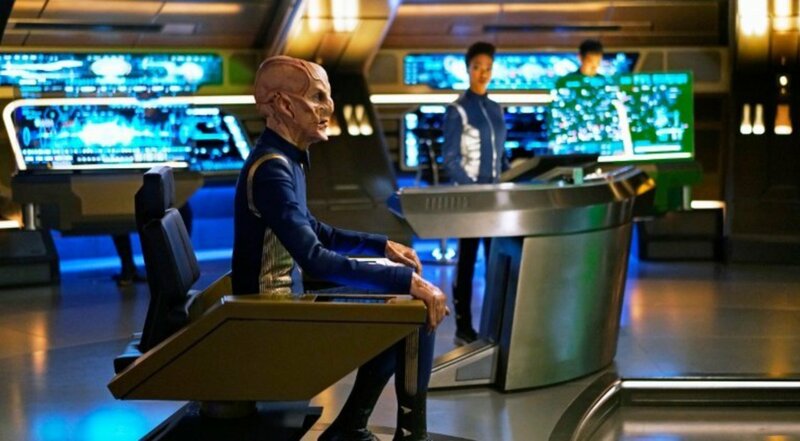 Saru is another interesting character in Discovery who is lost and isolated at the start. He is the first and only Kelpian in Starfleet and constantly seems to doubt his ganglia, abilities, and self. He even creates a computer program to compare himself to others. This doubt is further compounded by his absolute trust in Michael which is shattered when she mutinies – who can he trust now? Is everything he believed wrong? It takes the entirety of season 1 for him to become self-assured. The main difference between the themes of these two shows in this stage is that in DS9 everyone has suffered great losses at the start, but they are not lost. They are all fairly self-assured and know their place in the world, save Ezri Dax. 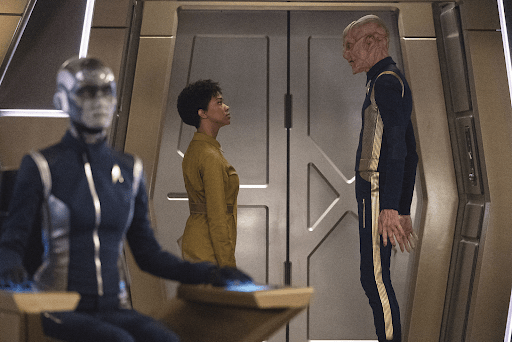 In Discovery, many lead characters have suffered great losses, but Michael and Saru in particular are lost. They don’t feel confident in their place in the world, in Starfleet, on the ship, or even as actualized sentient beings. It is not until the end of Discovery‘s first season that they regain their confidence and start to truly find their places. In DS9 the main characters’ self-assurance slowly gets eaten away with the Dominion War and Sisko’s entire sense of self changes as he is named the Emissary, ending with the series finale of him leaving to join the Prophets on their spiritual journey. Everyone ends the show in kind of a “what’s next?” sort of mentality: Sisko’s with the prophets, O’Brien leaves DS9 with his family to go teach on Earth, Odo goes to the Founders to save everyone and share what he’s learned. Now I know that I am only discussing Season 1 of Discovery, but the season ends with lots of hope: They return to their own universe after defeating Lorca, Saru deletes his program where he is trying to compare himself to other leaders and finds confidence in his abilities and himself, Michael is reinstated and everything is rosy again. DS9 has a lot of redemptive arcs to work with in its seven season run, but the redemptive arc I find most interesting is with the Cardassian Damar. He only wants to “Make Cardassia Great Again” (and in turn has more in common with Lorca than any other character in any series that I can think of) and, like all good villains, truly believes that everything he does is right and for the good of Cardassia. He sees that the Dominion has no love for Cardassia, only for the Dominion, and it is not long before he mounts his own rebellion. The moment I find most redemptive for Damar comes in “Tacking Into the Wind” (s7e22) when he and Rusot have to join forces with Kira to essentially learn “how to terrorist.” Rusot cannot seem to come to grips with taking orders from not only a Bajoran, but a former terrorist against the Cardassians. The moment of reckoning comes when Damar has to choose between Kira and Rusot, and he chooses Kira. His love for Cardassia is such that he would kill his own because he knows that Rusot will not help them win the war, but Kira truly could, and that decision is the peak moment in his redemptive arc. 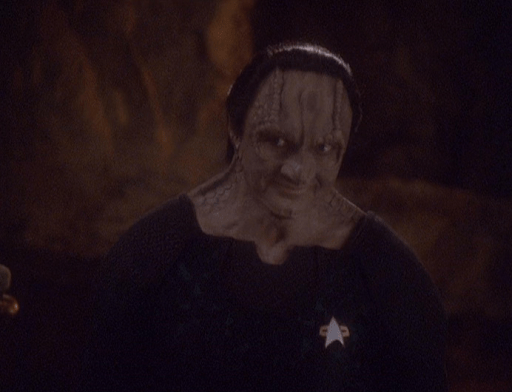 And I can’t talk about redemption without talking about Garak. Garak, who does not feel that he deserves any redemption, is one of the most complex characters on the show. We never fully understand what he did as part of the Obsidian Order, but we know it was rough stuff, and it naturally changes him. The thing that is most interesting about Garak’s redemption is that even though he is redeemed for his actions both during the Cardassian Occupation of Bajor and also the Dominion War, because of those actions he has nowhere to go. His redemption is the most enigmatic of anyone on Deep Space Nine, but then again, that is how Garak would want it. All of the Ferengi, as well, go through redemptive arcs on the show. 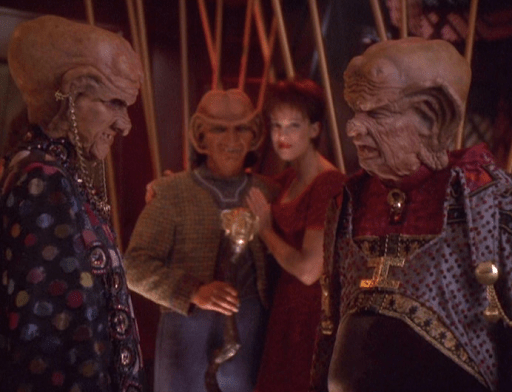 This is best illustrated with Rom and Nog, but Quark and even the Grand Nagus become more kind, empathetic, and generous by the end of the show’s run, to the point where what it means to be Ferengi has changed over the seven seasons. Nog goes from being a thief in season one to an ensign in Starfleet, the first ever Ferengi to join, and quickly is rising in the ranks due to his bravery and dedication. Rom starts the show beaten down and depressed because his wife left him for not being successful enough. By the end of the show, not only has he found true love with Leeta but he is made the Grand Nagus because of his compassion and smarts (“The Dogs of War” s7e24). Quark is still Quark, but he softens greatly over the course of the show, and despite not always agreeing with his family, his love for them and his growing ability to show it redeems him (in my eyes). Redemption is integral to the entirety of season 1 of Discovery. Michael must find redemption, whether she feels she deserves it or not, over the course of the season. Her brain, her drive, and in all truth her humanity are what allow her to find redemption. She falls in love with Ash Tyler, who turns out to be the Klingon Voq, and Sarek brings to her attention the irony therein, saying, “There is irony here, of course. The man you fell in love with was a Klingon… There is also grace. For what better source of peace exists than our ability to love our enemy” (“The War Without, The War Within” s1e14). She accepts responsibility for her actions and the fact that she started the Klingon War, but she also knows her duties and does everything she can to save as many of her crew as is possible. She learns from her misdeeds and strives to not make the same mistake twice, while still trying her best to remain true to herself and eventually her humanity. Voq/Ash Tyler is another character whose need for redemption controls his every action in Season 1. As Voq, the Torchbearer, he is an outcast, but also a zealot. Voq’s sacrifice of his body and soul to become Ash Tyler is admirable, even if we as the audience are supposed to see the Klingons as Michael and eventually the Federation sees them – the enemy. Ash and Michael fall in love, however, which puts a wrench in the Klingon infiltration plan. Voq/Ash’s compassion and heart are what redeems him in the end, even if, like Garak, he doesn’t feel it is deserved. Mirror Georgiou goes from being the an “Evil Emperor,” to getting deposed, to being saved by Michael, to helping to end the Klingon War and saving the Federation. Prime Universe Georgiou doesn’t need redemption, and Mirror Georgiou doesn’t think that she needs it. Georgiou, having been the Terran Emperor, has a totally different sense of morality than those in the Prime Universe. Her genocidal tendencies and ruthlessness lend themselves well towards a future career in Section 31 – especially considering what we know about Section 31 from Deep Space Nine (such as their desire to commit genocide against the Founders through Odo). Even though her methods are definitely unorthodox, her ability to immerse herself in the Federation and to use her knowledge from her tenure as the Terran Emperor to help the Federation provides her with at least a modicum of redemption, and in truth it affords her more growth than redemption, which is also very valuable in Star Trek. The respective wars plotlines in DS9 and Discovery start and end at different points in their runs, but ultimately Starfleet in both shows has an all-encompassing hope that they will win their war and achieve peace. The hope that Starfleet ideals will prevail. And neither is a blind or helpless hope. In both shows they fight and die for that hope, that dream of an empire of peace. Retreat is not on the table, and in other circumstances this unwavering fundamentalism would be seen as a bad thing, however, the hope for a better future that permeates their commitment to these wars is what keeps them grounded. In both series, they hope they can live up to what Starfleet can be, and achieve peace through those ideals. So while these shows are definitely different – being written and on air in totally different political and cultural climates, at different stages in their runs, and taking place at different times in Starfleet history – they have more in common than they don’t, in my humble opinion. The themes of loss, redemption, and ultimately hope permeate each series. They are both series about groups of people who must learn to accept each other’s flaws and foibles for the betterment of Starfleet as a whole. And, on a smaller level, are both shows that have characters who aren’t in Starfleet, pointing out the flaws within the system as well. They both argue that nothing is perfect, but Starfleet is still worth fighting and even dying for.